FC Thunder actively enforces this policy. 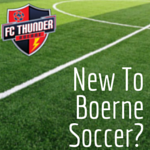 Individuals violating any aspect of the policy will be immediately dismissed from FC Thunder soccer facilities and may be permanently banned for the remainder of the season, and/or from the league. FC Thunder will notify law enforcement officials regarding circumstances involving physical altercations and/or assault or battery of any players, referees, coaches, or parents regardless of the claimed purpose or age of the offender(s). FC Thunder strives to create a safe and fun environment where youth may come together to play and learn physical and leadership skills. Please help support this environment by adhering to the policy while enjoying your child(ren) playing the great sport of soccer.